WHEN | WHERE Part one of 10-part series premieres Tuesday night at 10 on FX. MY SAY “The People v. O.J. Simpson” emphatically settles the question of guilt almost by the end of the opening episode. Yeah, he did it. Case closed, argument settled. You can see it in Gooding’s eyes, hear it in his voice. The facts point to an inescapable conclusion, too. This isn’t some revisionist history, or a Netflix-styled “Making of a Murderer,” where lingering doubts assume a life of their own, followed by a TV series of their own. Nothing lingers here. “O.J.” has the benefit of more than 20 years of hindsight and the rock-solid support of source material — Toobin’s book — that was preoccupied with human and social consequences of the murders instead of the verdicts. By briskly clearing away that question of guilt, “O.J.” can then get down to business. This series is a character study — and what characters these were — and also a deep, steady gaze into the abyss of race, class division and media culpability. “O.J.” offers a little something for everyone, from sociologists to casual onlookers, from Kardashian fanatics to even Simpson apologists. All of them will be satisfied. This truly is the best program of the year so far, and also the most ridiculously entertaining. That the brutal murder of two people should assume the basis of an “entertainment” is obviously something we, the people, got comfortable with long, long ago. The 1994-95 murder trial was so popular that soap ratings tanked. The nightly news programs not only led with O.J., but prime-time schedules were cleared for instant special reports. “O.J.” addresses that conflation — the blending of news and tabloid sensationalism — but finds narrative inspiration in it. TV sets are scattered everywhere on screen, in dingy squad rooms or lavish living rooms. Everyone stares into them with the same rapt gawk that we now reserve for our iPhones. Cops have cheap balky sets with small screens. Simpson has the best TV — a brand-new widescreen model, with dazzling graphics. Twenty-two years ago, the story quickly moved onto the screen anyway. Reality became hyper-reality. O.J. was the biggest show on earth. “O.J.” is framed in that bizarre context, too. Murphy, a showman who understands the power of these “optics” and stardom, has filled his cast with instantly recognizable stars — in theory, distracting, but on-screen just about perfect. They were all household names back then, from Clark to Judge Lance Ito (Kenneth Choi). Why not household names to portray them here? Nathan Lane as F. Lee Bailey? Schwimmer as Kardashian? Robert Morse as Dominick Dunne? Well, why not? As character studies, viewers can see right into hearts — or at least into places where the hearts should be. Bloodless and waxen, Travolta’s Shapiro is a polished ambulance chaser. Paulson’s Clark — with four perfect curls brushing her forehead — chain smokes with a vengeance. Schwimmer’s Kardashian is almost revelatory — the nicest of guys and the dimmest of bulbs. As Darden, Brown may be best of all — torn between two worlds, his struggle is palpable in every gesture and glance. Then, Gooding’s O.J. : Simpering, tearful, angry, ferocious, begging, remorseless. He’s one of just many Emmys waiting to happen here. 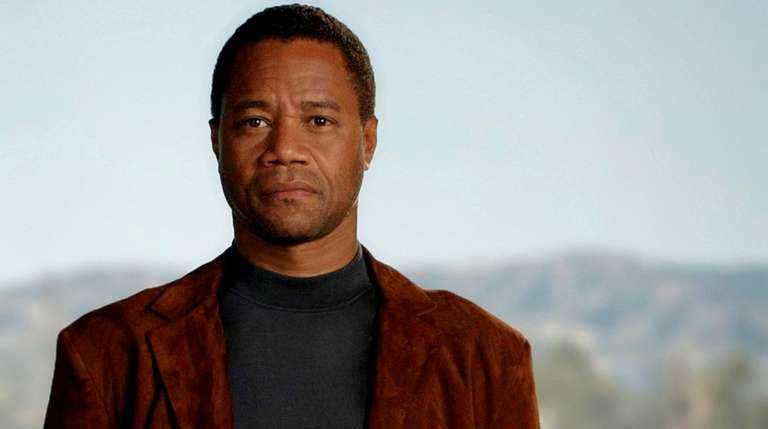 At turns, even his character's sanity seems suspect -- another "O.J." element that seems to eerily prefigure contemporary issues. Written by veteran screenwriters Scott Alexander and Larry Karaszewski, “O.J” offers a feast of words. Everyone gets lines that sparkle or are flat-out funny. Kato Kaelin (Billy Magnussen) maybe gets the best one of all: “Fame’s complicated.” Yup. The series opens with grainy footage of the Rodney King beating, which instantly orients viewers to “O.J.”s larger ambitions. This is a series about race. By exploring that from two points of views — most notably through Cochran’s eyes — the goal is to understand both the fury and joy following the criminal verdict. I haven’t seen all 10 episodes, but my hunch: Mission accomplished. BOTTOM LINE Best series of the year so far. Easily.